Utility of Fine needle aspiration cytology (FNAC) is well appreciated in investigating lymphadenopathy in patients suffering from Acquired Immunodeficiency syndrome (AIDS) and those who are Human Immunodeficiency Virus (HIV) positive. , In an immunocompromised patient, high index of suspicion is needed as there may not be epithelioid granulomas, giant cells or caseous necrosis. One helpful finding in some of these cases is the presence of negatively stained ghost images of tuberculous bacilli. This has been reported earlier in the literature. ,, We report two cases with negative staining and tried to document the ghost images as the actual mycobacteria. 35 year old HIV positive male patient with a CD4 count of 50, presented with bilateral cervical lymphadenopathy and fever of one month duration. There were multiple matted cervical lymphnodes on both sides. FNAC yielded purulent material. 20 year old HIV positive male patient with 2 month history of fever presented with right sided tender cervical lymphadenopathy. His CD4 count was 105. Aspiration yielded purulent material. Fixed smears were stained with Papanicolaou stain and air dried smears were stained with Giemsa and ZN-stain. Smear study showed scant cellularity, cells composed of neutrophils, lymphocytes, plasma cells and macrophages. Background was necrotic. Giemsa stained smears showed, in addition to cells mentioned, negatively stained ghostly rod shaped structures in the cytoplasm of macrophages and also in the background [Figure 1] and [Figure 2]. 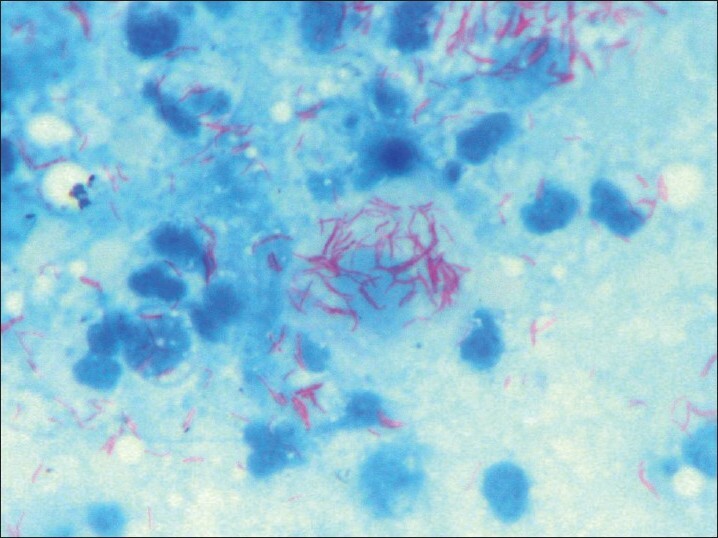 ZN-stain showed numerous acid fast bacilli. Both the aspirates were signed out as tuberculous lymphadenitis. 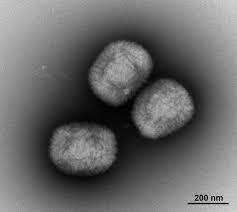 In both the cases, cultures grew Mycobacterium avium Intracellulare. 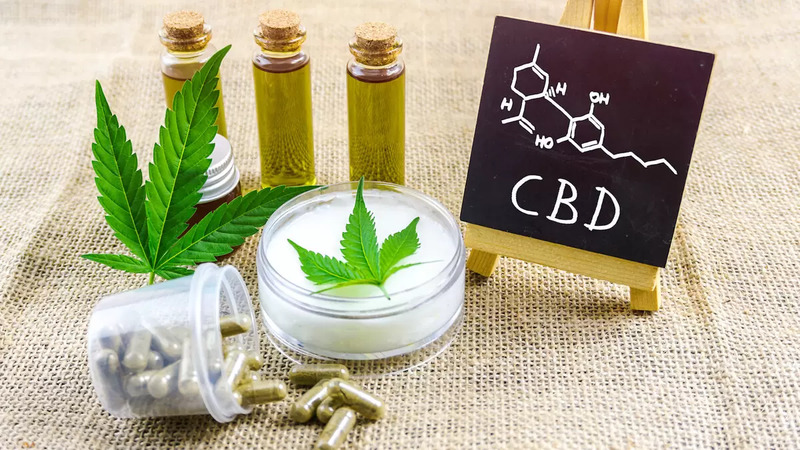 Various infections like, Mycobacterium tuberculosis, Mycobacterium avium intracellulare complex (MAIC), Histoplasma capsulatum, Cryptococcus neoformans, Toxoplasma gondii and various neoplasms like, lymphomas, Kaposi's sarcoma can present as lymphadenopathy in HIV positive patients. Classical cytological features may not be present in immunocompromised patients and on the contrary there may be suppuration rich in neutrophils or sheets of histiocytes in tuberculosis. One may miss these cases if mycobacteria are not looked for specifically by special stains. A different cytological pattern has been described in tuberculosis. FNAC smears stained by Romanovsky stains may show negative stained images in the cytoplasm of histiocytes and also in the background. , Maygarten and Flanders described these structures in Diff-Quick stains. Jannotta and Sidawy, too, described these images in ten cases of intraoperative imprint samples of lymphnodes in HIV infected individuals. Six of these cases turned out to be MAIC and the rest M. kansasi. Garza and Barboza described them in Papanicoloau stain in duodenal brush cytology. Lepra bacilli also seem to exhibit the similar property of negative staining. , In an immunocompromised patient, high index of suspicion is needed when typical cytological features are absent. Negatively stained ghost images of Tuberculous bacilli are a very helpful finding in such cases. This has been reported earlier in the literature. 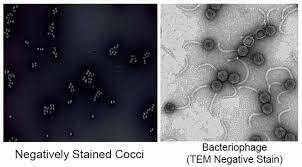 ,, In our cases, the figures are the well documented proof of negative stained ghost images being the actual bacilli [Figure 3]. First, we took images from the Giemsa stained slide and then the same slides were subjected to ZN stain and matched the areas. We noticed in our study that, the phenomenon of negative staining is also seen in H and E, Leishman, Gram stained smears, and the same smears can be subjected to ZN-staining without destaining to demonstrate the bacilli in negatively stained ghost areas as shown in the figures. 1. Martin-Bates E, Tanner A, Suvarna SK, Glazer G, Coleman DV. Use of fine needle aspiration cytology for investigating lymphadenopathy in HIV positive patients. J Clin Pathol 1993;46:564-6. 2. Jayaram G, Chew MT. Fine needle aspiration cytology of lymph nodes in HIV-infected individuals. Acta Cytol 2000;44:960-6. 3. Jannotta FS, Sidawy MK. The recognition of mycobacterial infections by intraoperative cytology in patients with acquired immunodeficiency syndrome. Arch Pathol Lab Med 1989;113:1120-3. 4. Maygarden SJ, Flanders EL. Mycobacteria can be seen as "negative images" in cytology smears from patients with acquired immunodeficiency syndrome. Mod Pathol 1989;2:239-43. 5. Stanley MW, Horwitz CA, Burton LG, Weisser JA. Negative images of bacilli and mycobacterial infection: A study of FNA smears from lymph nodes in AIDS patients. Diag Cytopath 1990;6:118-21. 6. Garza Guajardo R, Barboza Quintana O, Pérez Padilla P. Negative images due to MAI infection detected in Papanicolaou stained duodenal brushing cytology. Diagn Cytopathol 1998;19:462-4. 7. Jain S, Basu D, Chaturvedi KU. Aspiration cytologic diagnosis in clinically unsuspected leprosy - A case report. Indian J Pathol Microbial 1998;41:99-100. Authors of Document Al-Faraj, Z.H., Hassan, H.A., Abdalhamid, B.A., Al-Abbadi, M.A.